Now we want to cut this cube to make smaller cubes. We can do this by slicing the cube along XY, YZ and XZ planes. To get maximum number of smaller cubes with minimum number of required cuts, we should cut in equal numbers along all three axes. Let n be the number of smaller cubes along each edge. In a cube or a cuboid there are six faces in each. In a cube length, breadth and height are same while in cuboid these are different. 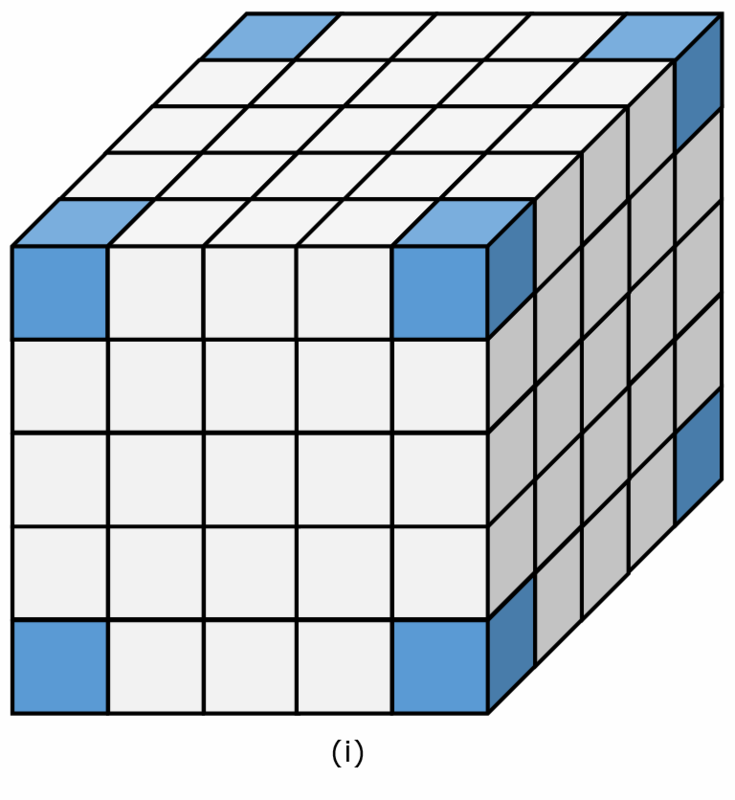 In a cube the number of unit cubes = (side)3. 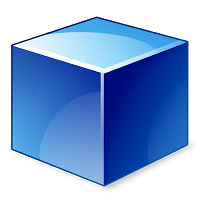 In cuboid the number of unit cube = (l x b x h). 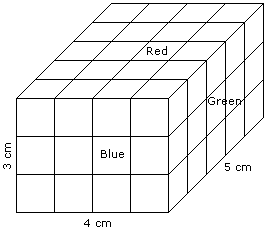 Example-1 A cube has its sides of 5 cm in length. It is cut to make smaller cubes of size 1 cm each. Then find number of such smaller cubes formed and minimum number of cuts required. Solution: Here smaller cube has side of 1 cm, while larger cube has its side of 5 cm. So we can have 5 such cubes on its each edges. 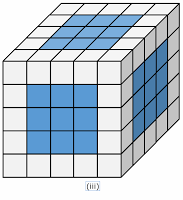 Example -2 Find the minimum number of cuts required to make 120 smaller cubes from a larger cube. Solution: In such type of questions when the required number is not a perfect cube, we find the way by which this number can be formed by multiplying three integers. 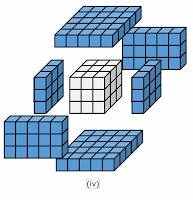 It is clear from the tables that minimum 12 cuts are required to make 120 cubes and we can do this by slicing 4, 5 and 6 times along its planes respectively. Find the nearest perfect cube number & find the cube root of it. Check whether the given number is divisible by the cube root found in first step. If not divisible then check the divisibility with one above or one below of that number, again if it is not divisible then try with next number and so on. After division find the factors of quotient keeping in mind that both numbers are nearest to cube root calculated in first step with minimum difference. If possible again arrange all three numbers in such a way that their sum is minimum. 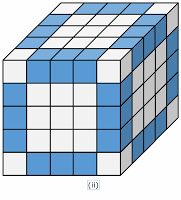 In our case we have to make 120 cubes and nearest perfect cube number 120 is 125. Now we divide 120 by 5, it gives 24 as quotient. 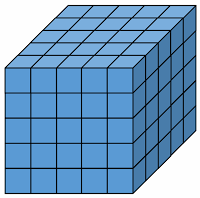 Example -3 Find the minimum number of cuts required to make 50 sub cubes. so we take either 3 or 5 to check the divisibility. Here 50 is divisible by 5, By dividing it by 5 we get 10 as quotient. 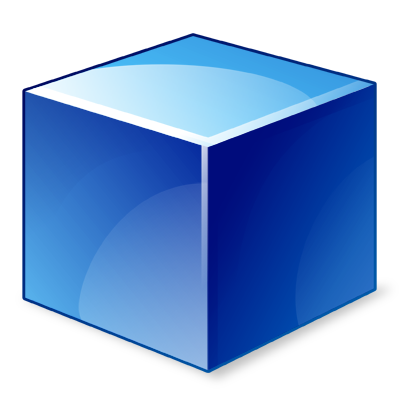 Example -4 Find the minimum number of cuts required to make 920 smaller cubes. Clearly it is divisible by 10, and we get quotient 92 by dividing 920 by 10. We take factor ( 4 x 23 ) because both numbers have least difference with 10 than other pairs. Now we are interested in cubes whose faces are painted with same color. We are taking example of ( 5 x 5 x 5 ) or 53 type of cube. 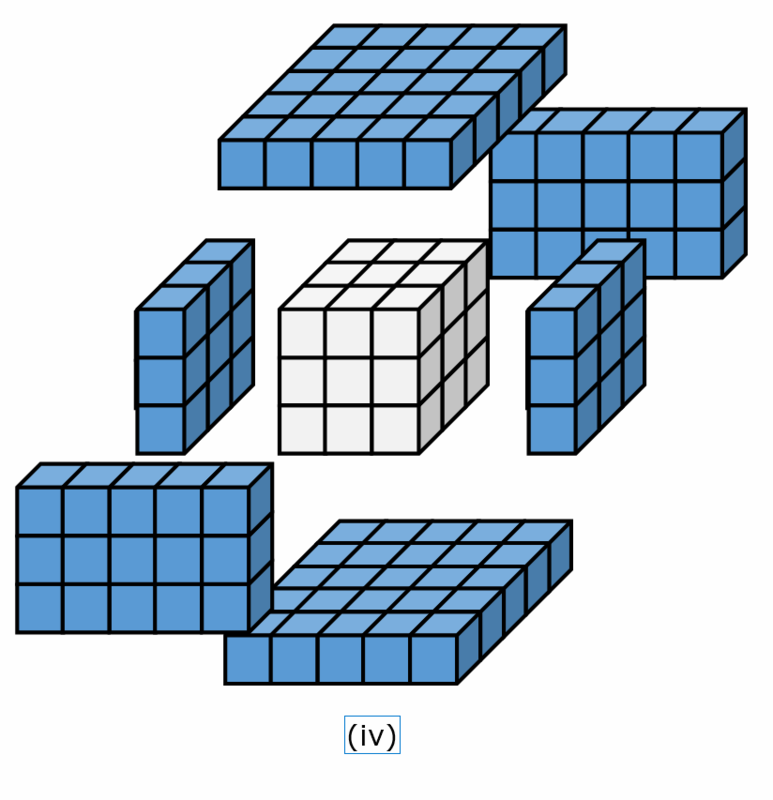 (v) How many cubes are visible from outside. (i) All the cubes at vertices or corners have three faces painted. There are 8 such cubes. For every cube of size 2x2x2 and above and painted in single color have 8 such cubes. The square at the longer end will form the top while the middle square will form the base. The rest 4 sides that consist of 2 unshaded squares and 2 partially shaded squares will form the lateral edges. 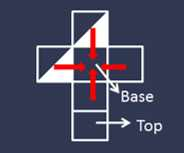 By rotating the dice formed, we would be able to visualize (1), (2) and (4). So, the correct option will be A. A cuboid shaped wooden block has 4 cm length, 3 cm breadth and 5 cm height. Two sides measuring 5 cm x 4 cm are colored in red. Two faces measuring 4 cm x 3 cm are colored in blue. Two faces measuring 5 cm x 3 cm are colored in green. Now the block is divided into small cubes of side 1 cm each. Question: How many small cubes will have two faces colored with red and green colors? 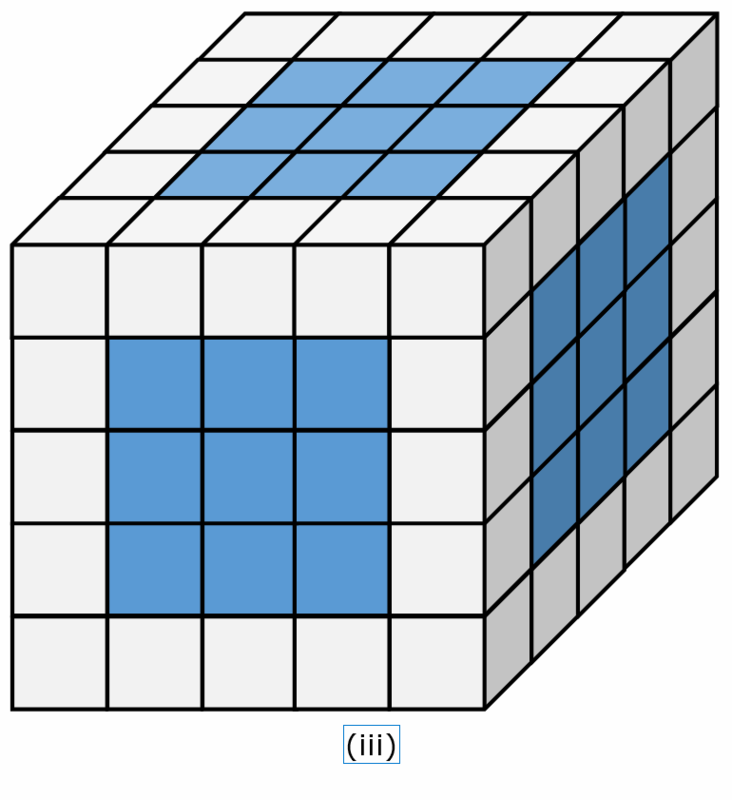 Other faces of the small cube could be colored or blank. Cubes painted red and green on two sides will be along the left and right sides (5 cm length each) of the top and the bottom face. Thus, no. 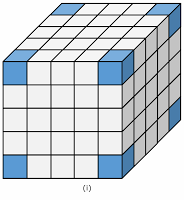 of such cubes = 5 x 4 = 20. 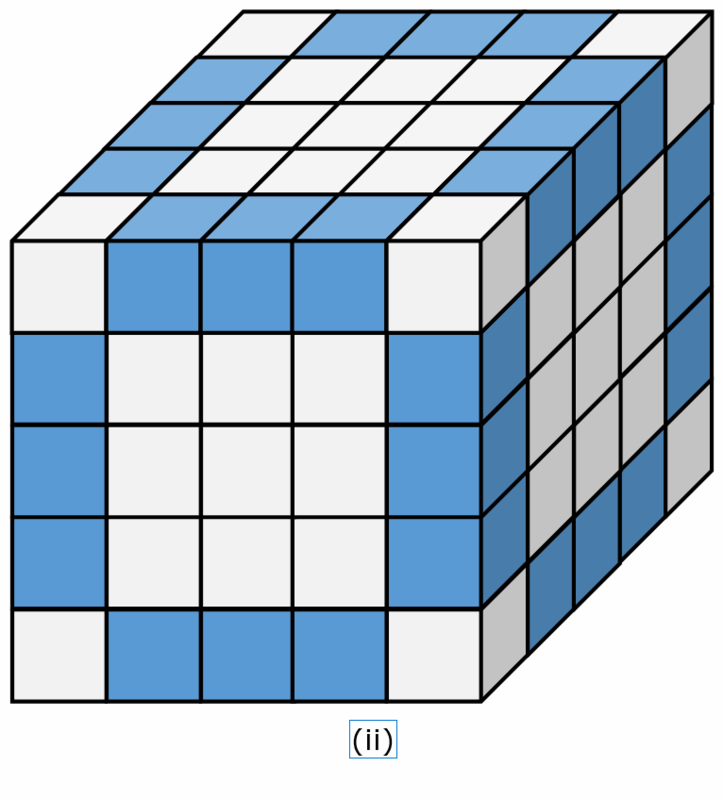 Answer is D.
Question: How many small cubes will have no faces colored? The cubes that will not be part of the faces of the cuboid will have no color. Thus, no. of such cubes = 2 x 3 x 1 = 6. So the correct answer will be D.